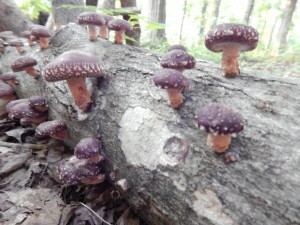 Recent work by Cornell, University of Vermont, and Chatham University in the Northeastern US resulted in the Temperate Forest Mushroom Growers Network, which provides growers with resources for the successful cultivation and marketing of log and forest grown mushrooms including shiitake, oyster, lions mane, and stropharia. Shiitake mushrooms have proven to be the most reliable and profitable of the four species. A 2014 marketing survey by Chatham University found there are currently 57 growers in the Northeast US, of which 51 are currently marketing log-grown shiitake off of 17,968 inoculated bolts, which represents a total gross revenue of $287,488, or an average of $5,637 for each farmer. The 57 growers alone are projecting an increase of inoculated bolts to 59,575 by 2018, which would result in revenue of $655,352. This does not include the prospect of new growers. Chatham University is continuing to research marketing issues this year, led by Director of Sustainable Agriculture Allen Matthews. In the last four years, classes and workshops facilitated by university extension educators have been overflowing with interest, with Cornell alone educating over 1,000 farmers and landowners in the practice of forest mushroom cultivation. Shiitakes in particular provide a profitable method of diversifying farm income by utilizing the by-products of sound forest management. Freshly cut hardwood logs are inoculated and fruit annually for 4 – 5 growing seasons. Log-grown shiitakes enjoy strong demand and are higher in quality and value than mass-produced indoor-grown shiitakes. 89% of respondents in the 2014 survey indicated demand consistently exceeds supply in their region. As the industry grows, many issues have emerged, ranging from concerns about proper mushroom identification, value-added products, the transport and sale of logs, and verification of sustainable practices. Cornell Small Farms is currently engaged with the Farm Bureau, state regulators like the New York State Agriculture & Markets and Eastern Plant Board, and others to address these emerging issues to benefit growers as well as the environment and food safety concerns. The new survey, released in February 2015, seeks to collect a comprehensive set of data from commercial growers in New York, the Northeast, and beyond to better understand production trends, issues that growers feel are important and emerging, and items needing further research and development.